Spring is the season for weddings, when the weather finally starts to warm up and the days start getting longer. By this time of the year, many people have started to receive invitations and ‘save-the-dates’ for spring weddings. And with them comes the dilemma – What To Wear. Waterside Events at Currumbin RSL plays host to weddings all throughout the year, but there’s no doubt that spring is our most popular wedding season. We’ve put together a list of the best spring wedding dresses for both guests and the bridal party. Spring weddings are a time for colour. Whether it is bold playful colours like hot pink bright blue and emerald green, or pretty pastel colours such as lilac, mint green or sunny yellow, you should choose a dress with colour. Floral prints are also a great option for spring weddings. If you’re unsure about the formality of the wedding you are attending and not sure what type of dress to choose why not choose a midi length dress? More formal then a cocktail length dress but not as formal as a full length evening gown, the midi length dress is absolutely perfect for a spring wedding, and it transitions perfectly from a daytime wedding ceremony to an evening reception. Spring weddings are also the perfect opportunity to rock a pretty lace dress. The most popular spring wedding dress pick from the team at Waterside Events is a midi length lace dress in a bright colour. You can’t go wrong with it! If you’re attending a church ceremony this is the perfect opportunity to buy one of the biggest trends coming this spring, a bolero or capelet. These are available in so many gorgeous fabrics such as lace, and sequin edged silk, and they’ll allow you to cover your shoulders, respecting the church setting and then take it off after the ceremony. For a spring wedding, coloured bridesmaid dresses are an absolutely must. If you want your bridesmaids to match why not go for a knee length floral print dress? These will work perfectly with the spring feel of your wedding. If you want your bridesmaid to wear mix and match dresses, then long floaty chiffon dresses in pastel colours are a great look. This will look pretty and modern, and you can let your bridesmaids choose their dress (or how they wear their dress) in a style that suits their individual body type. This is also a great look: if you pick just one colour, pastel-coloured chiffon dresses are the perfect spring bridesmaid dress. Spring wedding dresses for brides are all about romance. Lovely lace, floaty chiffon, flower decals, feminine bows and romantic silhouettes are all perfect for spring wedding dresses. Strapless wedding dresses and dresses with sweetheart and off the shoulder necklines are all perfect spring wedding dresses that will look romantic and elegant. According to the wedding dresses that were displayed at fashion week, plunging necklines are going to be all the rage this spring, adding a sexier feel to traditionally romantic spring weddings. 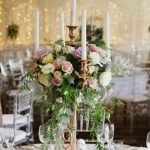 Need help on planning your spring wedding? Have a chat with us at Waterside Events. Our team can provide you with advice on themes, menus, venue options and other possible requirements. Send us your enquiries.